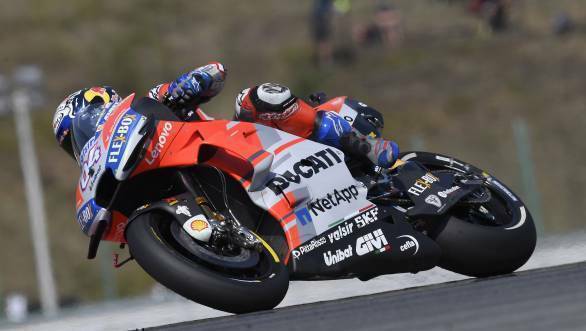 In a thrilling qualifying battle at the Czech MotoGP at Brno, Andrea Dovizioso clinched a fine pole position after a scorcher of a last lap to take pole position. 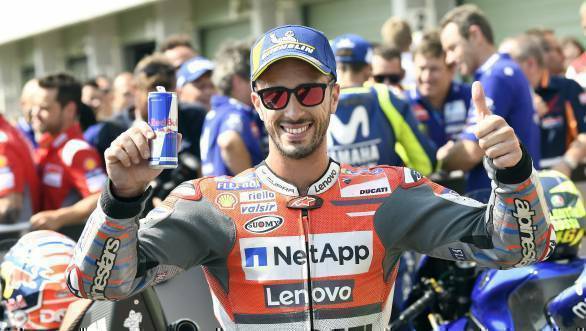 Ducati's Dovi managed to pip both Yamaha's Valentino Rossi and Repsol Honda's Marc Marquez to the front of the grid with a time of 1min 54.689sec. Jorge Lorenzo qualified fourth on the grid in the second Ducati, with LCR Honda's Cal Crutchlow in fifth place. Rounding off the second row of the grid was Pramac Ducati's Danilo Petrucci who set the sixth fastest lap time. Johann Zarco took seventh place on the grid, followed by Andrea Iannone and Alex Rins on the Suzukis. The fourth row of the grid is occupied by Dani Pedrosa, Tito Rabat and Maverick Vinales.